Chris Allen holds a Masters Degree in Archaeology from the University of New Mexico. She spent the majority of her career writing technical reports in the area of Cultural Resource Management. In 1990, Chris became involved in the government of the Village of Corrales, New Mexico, first as an elected official and later as a member of the village administration. During that time, she submitted articles to the local newspaper informing the public about issues and decisions affecting the residents. In 2014 she joined the Corrales Writing Group where she stretched her writing skills to include literary nonfiction, especially humor and memoir. 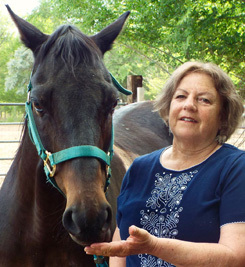 Chris is fortunate to live in Corrales with her husband and a menagerie of animals from horses to fish. They provide a continuous source of material for her comical essays. Her work has been published in two of the Corrales Writing Group’s award-winning anthologies. 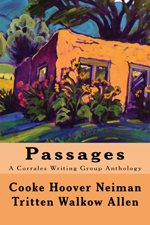 Passages is the fourth anthology from the Corrales Writing Group. It contains not only humor, fiction, essay, and memoir but the creative work of nineteen artists from the Corrales area. Passages contains all interior artwork in glorious color. 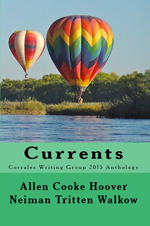 Currents is an anthology of work from the Corrales Writing Group for the year 2015. It includes humor, fiction, essays and memoir. 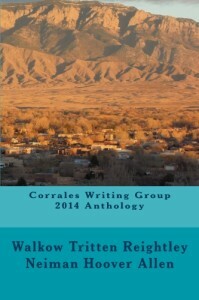 This anthology is a compilation of work written by members of the Corrales Writing Group. It includes memoirs, humor, philosophy, fantasy, poignancy, whimsy and fiction, to make the reader laugh, cry, smile, and reminisce. Topics range from romance, through travel, multiple types of aviation, jokes, the meaning of life, sailing, village life, close encounters with wild animals, a burial, an automobile accident, a bedtime and a children’s story.